We've got another special guest this week: Anne Ishii, a kickass critic, translator and blogger who I suspected would have strong opinions about Shimura. And I was right! Take it away, Anne! Mariko: Drokk, this place is disgusting! Did we kill the gardener? Damn. An identical twin, making a “they all look the same” joke about Japanese staff. If there were no other reason to believe this was written by Anglophones, this would be proof positive. The real farce is that the characters are actually so inconsistently un-Asian across the board. I’ll grant that in 70-100 years the Japanese people could possibly have all been on strict diets composed of nothing but steak, buttermilk and creatine. They’ll have all joined Olympic lifting teams and eliminated all joy from their lives. That’s in fact what Japanese people look like by the time Shimura has been outcast as a Judge in the police state of Hondo-City. I’ll also grant that this is a superhero narrative, where characters frequently look like they’re made of a bunch of boners, so looking for realistic depictions of anything, let alone humans, is about as useful as a body made up of boners. Nail the distinguishing physical features of Asian ethnicities without caricaturing the distinguishing physical features of the entire Asian race. Myself an Asian, I can draw an Asian with my eyes closed. No, literally. That’s pretty much what drawings of us all look like. People with our eyes closed. Let’s just be honest here. But nothing’s as irritating as being confused as a “fellow” Asian from the other side of the continent. 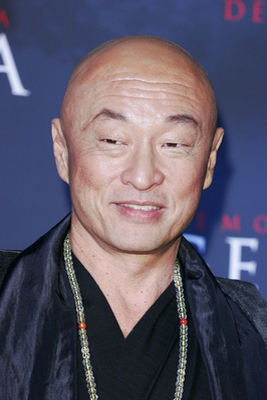 I can tell you Judge Inaba in “Outcast” is not Japanese. Phenotypically, she looks more like a suicidal Mongolian lesbian. 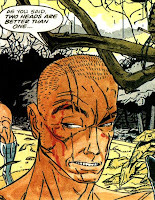 Judge Inaba by Frank Quitely is Vietnamese (possibly Laotian). Judge Inaba by Simon Fraser is probably the closest thing to Japanese, but we’re talking Ainu. The teacher in “Chambara” is not Japanese. She’s a Nepalese migrant waiting tables at a gay bar in Detroit. The Chiako Twins are half Japanese. Happas stand out like a sore thumb... or like superhero deltoids. Shimura’s physique changes so dramatically from page to page I don’t bother trying to figure out where he’s from. But I’ll point out this much. Shimura in "Fearful Symmetry" (page 85, last frame) is identical to the unrelated Sesoku in the second frame on page 1 of "Web" (Cyril Julien), and both look like Carey Hiroyuki-Tagawa, who is the scariest-looking Japanese man on Earth, and a recurring subject of my adolescent kidnap-and-ravage fantasies. I was a less scary-looking Japanese back then. DOUGLAS: Yeah, that's a big problem. Actually, more broadly, artistic inconsistency has been a persistent issue with Shimura almost from the get-go. Well, one of the issues. A little background: Hondo City (and its Judge uniforms) first appeared in "Our Man in Hondo," a 1989 story by John Wagner and Colin MacNeil that was... not Wagner's finest hour. (I suspect it might set off a finger-in-the-throat eruption.) 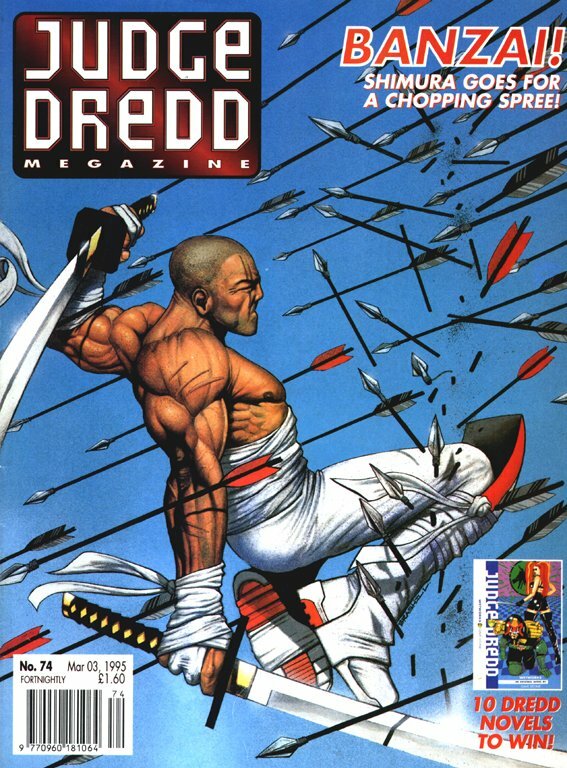 Robbie Morrison was fairly new to writing comics when he came up with the idea for a Dredd-world series set in Japan, and the first Shimura story he wrote was the incredibly densely packed "Outcast," for which MacNeil returned to the setting he'd devised a few years earlier. 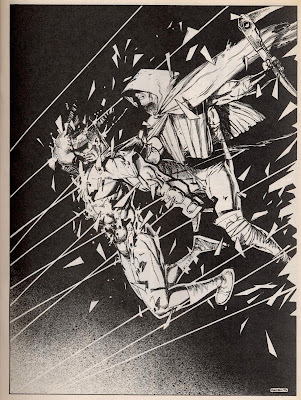 MacNeil was in the middle of drawing it when the first story in the book (also the first published), "Shimura," was commissioned as a prequel to "Outcast," to establish who Shimura and Inaba were before tossing the reader in head-first. 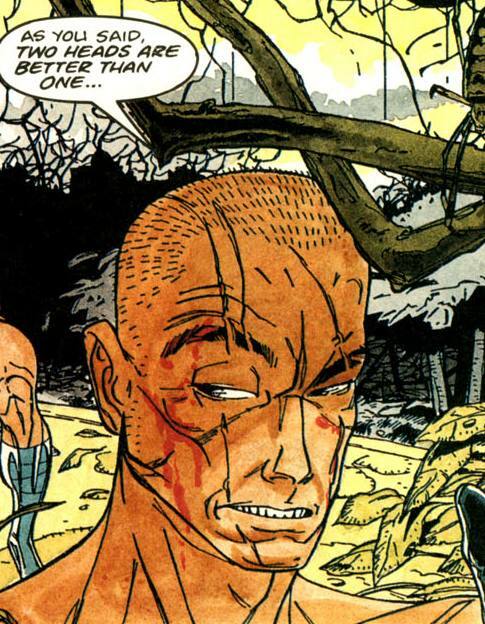 Quitely's artwork--what little there is of it--is what makes this book for me. He was still a relative unknown at the time he drew "Shimura" (he'd published two seven-page episodes of "Missionary Man," and that was it aside from small-press stuff), but he comes out blazing. Character acting, page design, the sound effects embedded on a plane we're seeing from an angle, the coloring-as-linework, the way his action scenes are all about potential energy rather than expressed kinetic energy: it's all there already (and he's doing it even better by the time of "Babes with Big Bazookas," just a few years later). 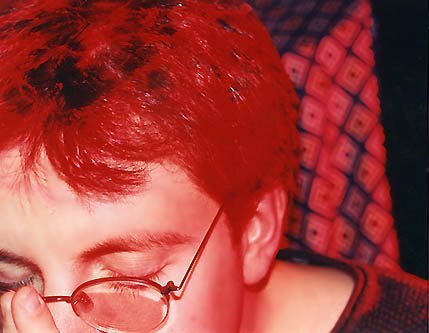 Morrison noted in a 1995 interview that the final episode of that initial serial "is a bit confusing. Somehow [Quitely] lost a page of script, but drew the entire episode nevertheless, missing out crucial plot details. By the time he realised, it was too late to redraw anything, so we did a hasty and slightly clumsy rewrite of the ending. Hopefully nobody noticed." I also like the way the first serial sets up what looks like the premise for the series--Shimura and Inaba as Batman and Robin, basically--and the second one immediately smashes that premise for good. Unfortunately, MacNeil, who's ordinarily a graceful storyteller, hits the speed-bump of "Outcast" (twelve panels on some pages is a heavy restriction to put on an artist who likes to use scale as much as MacNeil does, and he's much better with textured color than with black-and-white line art), and the whole thing starts to shake apart. Morrison's writing has a touch of what little manga was available to Anglophones in the U.K. in 1992; MacNeil's idea of "the manga look" is Goseki Kojima's art on Lone Wolf and Cub as filtered through Frank Miller's Ronin, plus a little of The Dark Knight Returns. (That third page of "Outcast," below, is totally a Batman and Robin pose.) But Morrison's trying to get so much done at once that it's one of the very few lengthy Dredd-universe stories whose plot sometimes doesn't track at all. And after that, this volume's mostly a mess. Simon Fraser was also a newbie at the time; he's come into his own since, with his artwork on Nikolai Dante and Lilly MacKenzie, but he's groping his way around in his early Shimura stories. And the Duke Mighten and Robert McCallum-drawn sequences are iffy at best. 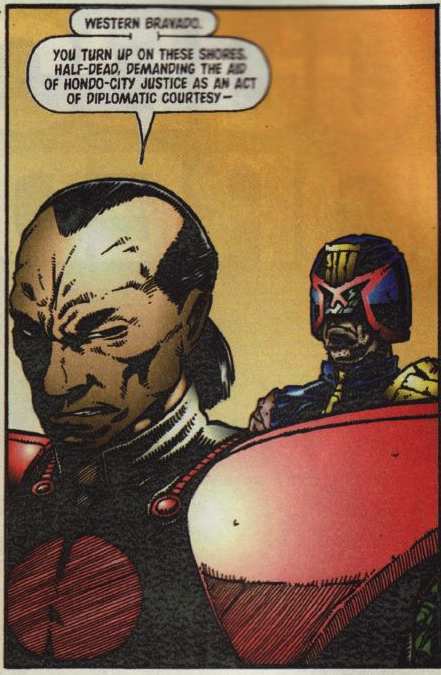 The low point is "Web," the Dredd team-up, in which the characters are shoved together in a way that obscures both of them rather than illuminating either of them. (Curiously, this collection omits one Mighten-drawn episode, "Heavy Metal," from Megazine 2.75; could it be because stories involving seppuku are Japanese Adventure Story Cliché #1? 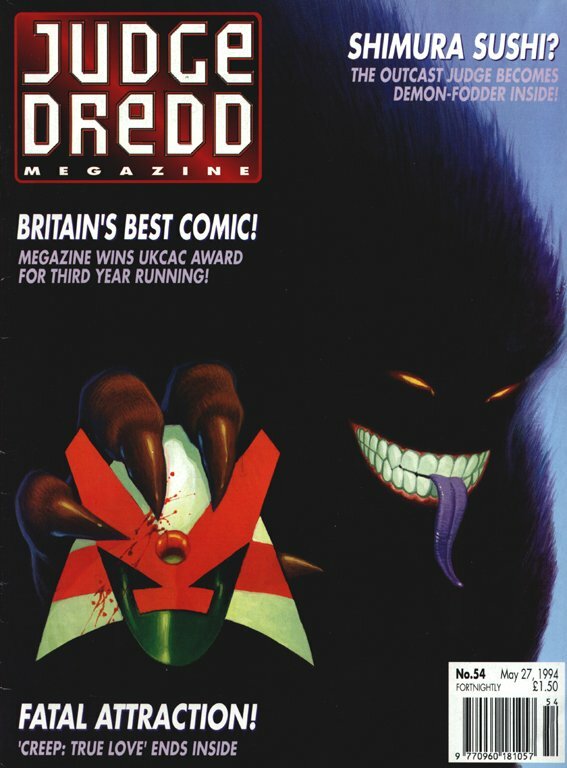 Also missing: both of the episodes drawn by Lol, from Megazine 3.35 and Judge Dredd Mega Special 1996. The big problem with Shimura for me, besides its occasional lack of clarity, is that it seems awkwardly shoved into the world of the Mega-Cities. It's a science-fictional "samurai without a master" story, but I don't know what it gains from making its protagonist a former supercop, and its take on Hondo-City doesn't really say much about Japan. Only the two Inaba stories at the end of the book (and occasional other moments, like the idea of a school of "transcendental assassination") get particularly near the satirical edge of Dredd, and without that dimension--a setting in which the power relations of our world are exaggerated to the point of ludicrousness--it keeps sinking into taking itself too seriously, a dry run for Nikolai Dante without that series' joie de vivre. Thanks again to Anne! Next week, Lori Matsumoto joins me to discuss the collection of what might be the least likely Dredd supporting character to go on to a serial of his own: The Taxidermist. Hmm, a Japanese set Sci-Fi yarn written and drawn by ( mostly ) Scots in 1991. I'd like to see how accurate a Scottish set Sci-Fi strip written and drawn by Japanese in 1991 would have been! Fair criticism though, it was very dense and very serious. I was actually going for Ainu, though for Shimura not Inaba, to emphasize his outsider status. I enjoy your Blog Douglas. "I’ll also grant that this is a superhero narrative, where characters frequently look like they’re made of a bunch of boners, so looking for realistic depictions of anything, let alone humans, is about as useful as a body made up of boners." pahahahaha! Brilliant and engaging article about a topic I thought I had little interest in. Anne is amazing interviewee and Douglas I admire your engagement with the topic and determination for reviewing every one of these. I will be tuning in next week for taxidermy. "Our Man in Hondo," a 1989 story by John Wagner and Colin MacNeil that was... not Wagner's finest hour. (I suspect it might set off a finger-in-the-throat eruption.)" Why don't you just insult my Momma, Wolk? 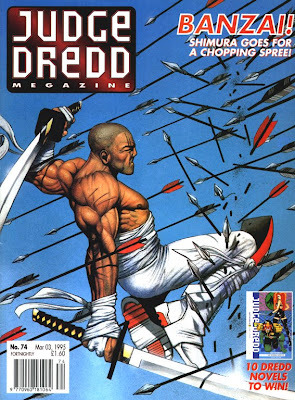 Also I never got the feeling that they intended to emulate Dredd's level of satire, I think Morrison just wanted to create a Japanese judge action hero. In defense of how Asians are drawn in English comics, no one else is really done that well either. Most artists either do one face and change up the hair and clothing, or cannot draw faces consistantly from page to page. And while I've not seen a Japanese manga set in Scotland the ones I've seen set in my own New York have detailed renderings of police cars, buildings, streets... and then draw the American men like gorillas and the women like Barbie dolls. So yeah, everyone could do more to up their game.